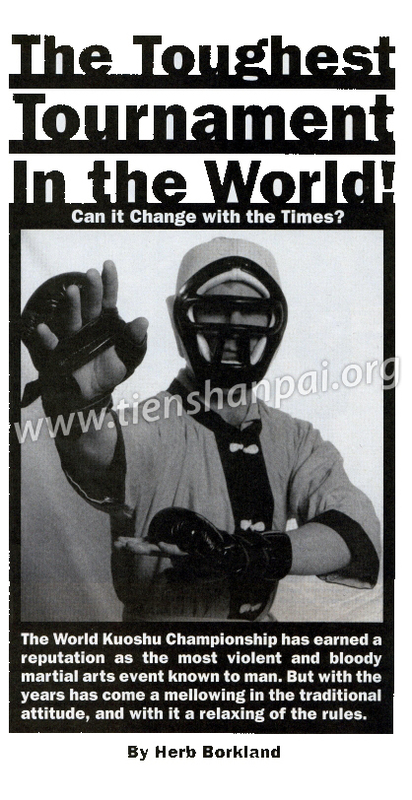 The following article was reprinted with permission from the August 1992 issue of Inside Kung Fu Magazine. For purchase and subscription information, contact Inside Kung Fu at cfw@pcspublink.com, or P.O. Box 461621, Escondido, CA 92046, (800) 877-5528. The World Kuoshu Championship has earned a reputation as the most violent and bloody martial arts event known to man. But with the years has come a mellowing in the traditional attitude, and with it a relaxing of the rules. The legend of that clobbering, gory 5th World Chinese Kuoshu Tournament in Taiwan echoes today, six years later. It’s what too many people think of when groping for an image of Taiwanese-style competition. Privately, its sponsors blame the 1986 fiasco on an unprecedented number of green fighters fronting wildly unequal abilities. But that does not explain why there were also so many charges of rampant favoritism in the judging. In fact, what was happening was that a triennial event first held in 1955 (for 168 fighters competing without benefit of weight classes or rounds), which had gone international in 1975, was by 1986 in danger of being declared outlaw—an intolerable affront to kuoshu’s proud heritage. What had gone wrong? From 1975-to-1983, nothing like the overwhelming brutality and controversy of 1986 had ever occurred. Even so, things had to change. But how, especially within an émigré organization whose conservative passion for “the way things used to be” was so strong that at times, for the International Chinese Kuoshu Federation, the past of kung fu has seemed almost more important than its future. Now, with its 1992 7th World Tournament booked for autumn in Taipei, the once-every-three-years call has gone out again from the United States Chinese Kuoshu Federation, urging full-contact fighters to attend the Maryland trials in August. Then, September in Taiwan, ten men and seven women will stand up and fight for America on kuoshu’s fabled lei tai, the wooden platform on which they battle and bleed. “Kuoshu” means “national art,” and is a politically charged way of saying “kung fu,” by being democratically opposed to its rival Communist sibling, the better-known Mainland Chinese wushu (“war art”), “Kuoshu” was the patriotic term adopted by the Central Government of China back in 1928, in recognition of kung-fu’s unique cultural value. A Central Kuoshu Instituted was founded in what was then China’s capital city, Nan Ching, where prospective students had to take an entrance exam sufficiently stiff to have flunked even run-of-the-mill regional champions. Under the supervision of headmaster Change Chi Chiang, a faculty of the great masters designed a training program called the First Annual Class; and, prominent among its first graduates, could be found the 63rd grandmaster of tien shan pai, Wang Chueh-Jen. Remember that name. The decade that followed, we are told, is fondly nicknamed “the Golden Years of Chinese martial arts.” Then, after the Civil War and Communistdsfa Mao Zedong’s 1947 triumph, the Central Government fled to Taiwan, R.O.C., bringing kuoshu along. Since beingcast out, Taiwan has maintained its kung-fu with that ferocious purity which often distinguished the nostalgic arts of exiles. pai has everything but enough time. But there’s no disguising the fact that kuoshu fighting is rough stuff. Sifu Huang makes no apologies “If you study martial arts three years, and I didn’t, you can use a clear technique to knock me out. Very clear, very pretty. But if you study three years, and I study three years, you have to get me, I have to get you. What’s it going to look like? Not pretty. He cites the example of judo. A judo demonstration is unfailingly smooth, economical and artistic: now go see a real match. Not pretty. All this leads to the fact that traditional Chinese tournaments never featured forms competition. In fact, it irritates and bemuses kuoshu members that today a person who has never once fought can nonetheless be acclaimed a master because of the excellence of his style. Not that sifu Huang despises forms— tien shan pai has many stunning ones, and he himself is a coach of international form champions. It’s just that, “People who emphasize fighting aren’t going to do too good in the forms If people do very good in the forms, (it) does not mean they can fight,” he explains. Much progress has been made since kuoshu’s first big tournament In 1955, when there were no weighs divisions, pads, headgear or groin cups. It wasn’t until 1975’s first official World Tournament that they even both end having rounds, But. after 1986-s disaster, at the 1989 6th World Cup—staged ineptly and to scant public notice in Las Vegas—more changes had to be made in three years than during all the proceeding 21 years of open kuoshu competition. Competitors ambitious to represent their county in the World Cup must first come fight in August in the 2nd American Championship toy be held by sifu Huang at the Timonium Holiday Inn. The good news is a new style of mandatory face masked headgear will be worn ( which also somewhat protects the ears and not much else.) along with special open-fingered gloves. These unique gloves which have a trace of padding and yet permit grappling, replace the cotton gardening gloves which where previously de rigor. Of great symbolic importance-and affording the audience a better overall view- is the adoption of the classic Lei Tai Platform (two-to four feet high and either 24 feet by 24 feet or 30 feet by 30 feet), which has no ropes on which to get caught. Kuoshu’s new-look book institutes a three point penalty for getting blown off the stage, and two points for being put down while still on it, plus there is a three-knockdown rule. Fighting is continuous; it’s best two out of three: win the first two round and the third isn’t required. A clear kick or punch is worth one point but a knockdown merits two points. Since grappling, sweeps and takedowns are also legal, blue-corner and yellow corner combatants who clinch have three seconds for one to drop or be lock up before the white-uniformed referee breaks them and points are declared. A chin na grip successfully held on an opponent for five sec wins the whole shootin’ match. Elbow sticks will be forbidden in the 2nd American Cup this summer, and females must wear a chest protector. Solos and weapons aren’t banned, but their appearance is given a typical kuoshu twist. When the last time you went to a tournament where all the fighters were first required to demonstrate a empty-hand form or a weapon, not for a troghy, but simply to make the cut? If you can’t proform like a Chinese stylist, they won’t let you fight. Those competitors who’ve heard talk of outrageous bias in some of Taiwan Would Tournament (not the American Cup) judging are offered realism rather then excuses by Sifu Haung. He also points out the trouble and expense his Federation goes to in training its officials, and adds that, in any case, there is always arbitration by videotape instant-replay of all disputed matches. Does he look first for physical ability or heart in his fighters? So, American Fighters, women and men, the grandmaster offers you Taipei and a chance to take on champions from 30 nations for a shot at the toughest trophy on the planet. Win or lose, he says that he will respect you just for stepping up onto the lei tai. And this is a gentleman, so unassuming-looking, whose respect is worth having, perhaps especially because he personally seems far removed from all violence. Indeed, something much more positive and powerful haloes steely Huang Chien-Liang. Meeting him, one’s faith is unexpectedly renewed in hung-fu’s most contradictory promise-that there is a way to unveil transcendent calm through practicing the harshest arts of war. As a nice parting gesture, the grandmaster shows the beautiful, one-of-a-kid sword his teacher designed and presented to sifu Huang, its leather scabbard engraved with what is, in effect, his tien shan pai diploma. The 64th heir also points to a cunningly wrought dragon motif which has been worked into the overall design. Grandmaster Huang smiled pleasantly-this mild mannered dragon whose world-class powers, like an unseen tail, are hidden behind an everyday man’s quiet manner. He stands for the cutting edge. And if it is the cutting edge, why be surprised to see blood on it. About the Author: Herb Borkland is an East Coast-based martial artist and freelance writer.